Colorectal cancer (CRC) arises as a consequence of genetic events such as gene mutation and epigenetic alteration. The aim of this study was to identify new hypermethylated candidate genes and methylation-based therapeutic targets using vincristine in CRC. We analyzed the methylation status of 27,578 CpG sites spanning more than 14,000 genes in CRC tissues compared with adjacent normal tissues and normal colon tissues using Illumina bead chip array. Twenty-one hypermethylated genes and 18 CpG island methylator phenotype markers were selected as candidate genes. The methylation status of 39 genes was validated by quantitative methylation-specific polymerase chain reaction in CRC tissues, adjacent normal tissues, normal colon cells, and three CRC cell lines. Of these, 29 hypermethylated candidate genes were investigated using the demethylating effects of 5-aza-2′-deoxycytidine (5-aza-dC) and vincristine in CRC cells. Thirty-two out of 39 genes were hypermethylated in CRC tissues compared with adjacent normal tissues. Vincristine induced demethylation of methylated genes in CRC cells to the same extent as 5-aza-dC. The mRNA expression of AKR1B1, CHST10, ELOVL4, FLI1, SOX5, STK33, and ZNF304 was restored by treatment with 5-aza-dC and vincristine. These results suggest that these novel hypermethylated genes AKR1B1, CHST10, ELOVL4, SOX5, STK33, and ZNF304 may be potential methylation biomarkers and therapeutic targets of vincristine in CRC. Colorectal cancer (CRC) is the third most common cancer and the second leading cause of cancer death in the world. CRC is a consequence of genetic events including gene mutations and epigenetic alterations that transform colonic epithelial cells into adenocarcinoma cells . The early detection of CRC is most important in cancer patients to reduce cancer mortality . Different stages of CRC have different prognoses and the effects of adjuvant chemotherapy differ between CRC stage II and stage III . Current CRC chemotherapy consists of a combination of cytotoxic DNA antimetabolites, such as 5-fluorouracil, leucovorin, or oxaliplatin. However, the best combination of these anticancer drugs is still not fully established . To achieve this, epigenetic DNA methylation was reported as a suitable approach for a better understanding of CRC progression and therapeutic targets . A great number of studies have focused on the epigenetic alterations of tumor suppressor genes in the regulation of cancer initiation and progression . Gene-specific methylation changes in promoter CpG regions have been largely related to biological processes of tumor progression including cell proliferation, communication, adhesion, mobility, signal transduction, and drug resistance . 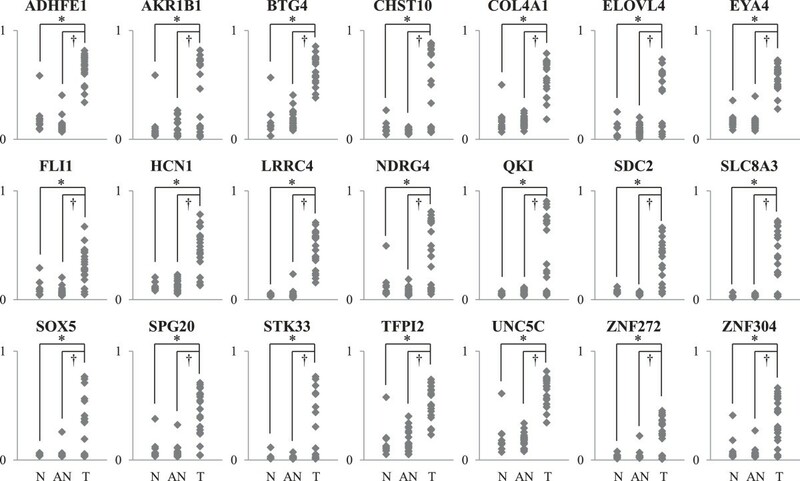 Aberrant methylation of CpG islands in the promoter or exon 1 regions of tumor suppressor genes has been correlated with transcriptional silencing of downstream genes in colorectal cancer [8, 9]. Many genes silenced by aberrant methylation, including CDKN2A, THBS, and SFRP, have been proposed to be associated with CRC tumorigenesis [10–13]. Moreover, promoter methylation was also referred to as the CpG island methylator phenotype (CIMP) [14, 15]. CIMP-positive CRC was distinguished from CIMP-negative CRC patients by clinicopathological factors , and CIMP was associated with development of the serrated pathway of CRC . Clinically, several CIMPs containing MLH1 (a mismatch repair gene), and microsatellite instability were characterized to be associated with CRC prognosis [18, 19]. Furthermore, a panel of CIMP including RUNX3, CACNA1G, IGF2, and MLH1 consists of specific markers for clinical trials . Hughes et al. reviewed the existing literature of 640 potential relevant papers to summarize CIMPs in CRC . Although there are many lines of evidence that have been proposed as potential biomarkers for CRC in humans, many researchers continue to research new CRC-specific methylation markers. Recently, methylation chip array techniques have been widely used to identify new DNA methylation biomarkers in CRC. However, array data are needed to confirm other methods such as quantitative methylation polymerase chain reaction (PCR) (QMSP), methylation-sensitive high-resolution melting, and pyrosequencing [22–24]. QMSP is a sensitive tool and offers quantitative analysis of DNA methylation status . Vincristine is a vinca alkaloid from the plant Catharanthus roseus, and mainly arrests mitosis in metaphase by binding to tubulin dimers . It is used as a chemotherapy drug for various types of cancers, including non-Hodgkin’s lymphoma , acute lymphoblastic leukemia, lung cancer, breast cancer, and CRC [28–31]. Recently, cyclophosphamide, vincristine, and prednisone (COP) chemotherapy was used to significantly improve overall survival and progression-free survival in primary colonic lymphoma patients . There was one report that low concentration of vincristine reduced the methylated cytosine in human lung adenocarcinoma cells . However, the DNA methylating-based effects of vincristine are still unknown for methylation marker genes in CRC. In this study, to identify new hypermethylated candidate genes in CRC patients, we analyzed methylation profiles using bead chip array-based technology and QMSP. In addition, to identify methylation-based therapeutic target genes, the demethylating effect of vincristine was examined using 21 hypermethylated candidate genes and 18 CIMP markers. Correlations between methylation status and mRNA expression were analyzed by reverse-transcription PCR. Thirty-one pairs of colorectal cancer (CRC) tissues and adjacent normal tissues and 10 normal colon tissues were obtained from the Department of Colorectal Surgery, Korea University Medical Center. The characteristics of each subject are summarized in Table 1. This study was approved by the institutional review board of Korea University and informed consent was obtained (IRB No. KU-IRB-10-08-A-1). The diagnosis of CRC tissues was acquired from pathology reports, the institutional review board, and histological evaluations. Fresh tissue samples were frozen in liquid nitrogen after resection and stored at −80°C. One normal colon cell line (CCD18Co) and three CRC cell lines (SW480, Dukes’ type B; DLD-1, Dukes’ type C; LoVo, Dukes’ type C and stage IV) were obtained from the American Type Culture Collection (Manassas, VA, USA). CCD18Co cells were cultured in Eagle’s minimum essential medium and the three CRC cells were cultured in RPMI 1640 medium, all supplemented with 10% fetal bovine serum (Hyclone, Logan, UT, USA) and 1% penicillin/streptomycin (P/S; Invitrogen), and maintained at 37°C and 5% CO2 atmosphere. Genomic DNA was extracted using the QIAamp DNA Mini-Kit (Qiagen, Valencia, CA, USA) according to the manufacturer’s recommendations. Tissue samples were ground up by 3-mm diameter punches and then mixed with 700 μL lysis buffer containing 20 μg/mL Labo Pass protease K (Cosmo Gene Tech., Seoul, Korea), 20 mM Tris∙HCl (pH 8.0), 5 mM EDTA (pH 8.0), 400 mM NaCl, and 1% SDS solution (Sigma-Aldrich, St. Louis, MO, USA). The mixed samples were incubated at 42°C overnight. After incubation, genomic DNA was purified by phenol/chloroform extraction. Genomic DNA was eluted in 100 μL of water and quantified with a NanoDrop ND-100 device (Thermo Fisher Scientific, Hudson, NH, USA). Two micrograms of genomic DNA in a volume of 20 μL RNase-free water was bisulfite-converted using the EpiTect fast DNA bisulfite kit (Qiagen). Bisulfite conversion was performed according to the manufacturer’s recommendations. The reaction was performed by mixing 85 μL bisulfite mix solution and 35 μL DNA protect buffer in 200 μL PCR tubes at room temperature. The bisulfite-converted genomic DNA was eluted from the column with 100 μL dH2O and stored at −80°C until use. Human Methylation 27 DNA Analysis Bead Chip (Illumina Inc., San Diego, CA, USA) is a methylation-profiling technology based on bisulfite modification of DNA. This bead chip array can provide methylation information at a single-base resolution for 27,578 CpG sites spanning more than 14,000 genes. One microgram of bisulfite-converted genomic DNA was applied to the bead chips using Illumina-supplied reagents and conditions. After extension, the array was fluorescently stained and scanned, and the intensities of the M (methylated) and U (unmethylated) bead types were measured. Each methylation data point is represented by fluorescent signals from the M and U alleles. The ratio of fluorescent signals was then computed from the two alleles; β value = (max (M, 0))/(|U| + |M| + 100). The β value reflects the methylation level of each CpG site. A β value of 0–1.0 indicates the percent methylation from 0% to 100%, respectively. Quantitative methylation status in the bisulfite-converted genomic DNA was confirmed by quantitative real-time PCR using the 7000 HT Real-Time PCR System (Applied Biosystems) according to the manufacturer’s recommendations. Methylation primers for 21 candidate genes and 18 CIMP markers were designed using the MethPrimer software (http://www.urogene.org/methprimer/). Primers for QMSP were designed for large promoter CpG islands containing detected CpG sites near the transcription start site (Additional file 1: Table S1). PCR reactions were performed using an optical 96-well tray in a final volume of 20 μL. The reaction mixture consisted of 5 μL 2X Maxima SYBR Green/ROX qPCR master mix (Thermo Fisher Scientific), 250 nM of each primer, and 30 ng of bisulfite-converted DNA template. The QMSP program was as follows: 50°C for 2 min and 95°C for 10 min, followed by 45 cycles at 95°C for 15 s, and then 60°C for 1 min. After PCR, a thermal melt profile was performed to examine the homogeneity of the PCR application. Each DNA sample was analyzed in duplicate, and the mean quantity was used for further analysis. Relative quantification of the amplified gene levels in the bisulfite-converted genomic DNA sample was performed by measuring the threshold cycle (CT) values of target genes and β-actin (ACTB). The mean quantity of genes was divided by the mean quantity of ACTB and was used for the normalization of input DNA. The negative values for ACTB were excluded from the methylation analysis. The bisulfite-converted genomic DNA of a known concentration was drawn at 1, 1/4, 1/16, and 1/64 via serial dilutions, and then used in a standard curve for quantification. The modified genomic DNA by CpG methyltransferase M.SssI (NEB, Ipswich, MA, USA) was used as a positive control according to the manufacturer’s recommendations. DNA methylation according to M.SssI was verified using the restriction enzyme BstUI (NEB). mRNA was extracted using the commercial RNeasy Mini-kit (Qiagen, Hilden, Germany) according to the manufacturer’s recommendations. The mRNA was eluted in 20 μL of DEPC water (Qiagen) and quantified with a NanoDrop ND-100 device (Thermo Fisher Scientific). One microgram of mRNA from each sample was subjected to cDNA synthesis using Maloney murine leukemia virus RT and random hexamers (Promega, Madison, WI, USA). cDNA synthesis was performed according to the manufacturer’s recommendations by mixing 1 μL of 1 μg mRNA, 4 μL 5X RT buffer, 1 μL 500 nM oligo dT, 1 μL 10 mM dNTP, 0.5 μL RNasein, 1 μL M-MLV reverse transcriptase, and 11.5 μL dH2O in PCR tubes. The mixture was then incubated at 37°C for 1 h. cDNA was diluted with 20 μL dH2O and stored at −80°C until use. Primers were designed using primer3 version 0.4.0 (http://primer3.ut.ee/) and are shown in Additional file 1: Table S2. cDNA was amplified by PCR with primers for each target gene. The RT-PCR program was as follows: 95°C for 10 min, followed by 35 cycles at 95°C for 15 s, 60°C for 15 s, and then at 72°C for 45 s. ACTB was amplified simultaneously with the other PCR products and was used as a control for RNA integrity. To determine the optimal concentration of 5-aza-2′-deoxycytidine (5-aza-dC) and vincristine (Sigma-Aldrich) in CRC cell lines, we measured cell viability with the MTT assay (Additional file 2: Figure S1) according to the manufacturer’s recommendations using MTT reagents (10 μL/well, 7.5 mg/mL in phosphate-buffered saline) and dimethyl sulfoxide (50 μL/well, Sigma-Aldrich). To identify the demethylating effect of treatment with anticancer drugs, CCD18Co, SW480, DLD-1, and LoVo cells were seeded in six-well culture plates (SPL LifeSscience, Pocheon, Korea) at a density of 0.5 × 105 cells per well. After 24 h, cells were cultured in serum-free media containing either 30 μM 5-aza-dC or 100 nM vincristine in 10 μL dimethyl sulfoxide for 48 h at 37°C in a 5% CO2 atmosphere. After 48 h, cells were washed in PBS (Sigma-Aldrich) three times and then harvested. The statistical significance of the methylation bead chip array data was determined using a paired t-test based on Δβ means (means of β value in CRC tissues – means of β value in normal tissues). The methylated intensity ratio in CRC was confirmed by fold-change (methylated intensity ratio of CRC tissues/methylated intensity ratio of normal colon tissues) and odds ratio (methylated intensity ratio contract of unmethylated intensity in CRC). The false discovery rate (FDR) was controlled by adjusting the P value using the Benjamini-Hochberg algorithm, the incorrectly substituted probabilities of specifically observed methylation CpG sites for each gene in P values. The methylated intensity ratio of QMSP was determined by the percentage of methylated reference (PMR) gene, and the PMR value was defined as [(GENE)sample/(ACTB)sample]/[(GENE)M.SssI/(ACTB)M.SssI] × 100. The significance of different PMR values among CRC tissues and adjacent normal tissues was defined with the chi-squared test and analysis of variance test using Sigma Stat (SPSS Inc., Chicago, IL, USA). All statistical tests were two-sided and P values of < 0.05 were considered to indicate statistical significance. To identify the aberrant methylation of various genes in CRC, we performed a methylation chip array in 10 normal colon tissues, and 21 CRC tissues and adjacent normal tissues. We found a total of 3,177 CpG sites in the promoter regions (1,704 CpG sites, 53.6%) and non-promoter regions (1,473 CpG sites, 46.4%), with aberrant methylated CpG sites identified in CRC tissues compared with adjacent normal and normal colon tissues, according to statistical significance determined by the paired t-test and an FDR P value of <0.001 based on a Δβ mean of 0.1. Among 3,177 CpG sites, we identified 597 genes with hypermethylated CpG sites in promoter CpG islands (data not shown). Finally, we selected 21 candidate genes that contained strongly hypermethylated CpG sites in promoter CpG islands in CRC tissues compared with adjacent normal tissues (Figure 1). Hypermethylation of promoter CpG sites for 21 genes by methylation chip array. 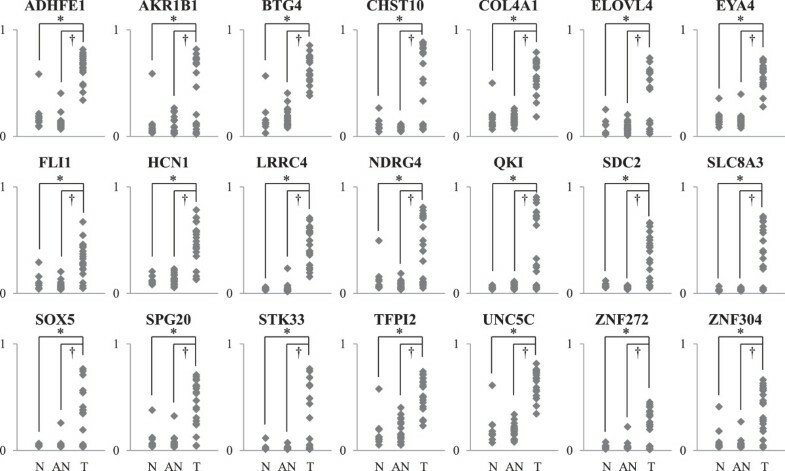 The methylation statuses of CpG sites in promoter CpG islands for 21 genes were identified using methylation chip array in 10 normal colon tissues, 21 CRC tissues, and 21 adjacent normal tissues. All genes were significantly strongly hypermethylated in their promoter CpG islands in CRC tissues compared with adjacent normal tissues and normal tissues (P < 0.05). N: normal colon tissues, T: CRC tissues, AN: adjacent normal tissues. To confirm the methylation status of 21 candidate genes from the array results and 18 CIMP markers, we validated the methylation status in the promoter CpG islands of selected genes by QMSP in 10 different CRC tissues compared with adjacent normal tissue. The quantitative analysis with the PMR value supported the differential methylation status between CRC and normal tissues. The methylation status in the promoter CpG islands of all candidate genes was frequently higher in CRC tissues compared with adjacent normal tissues except FLI (Figure 2A). The methylation status of 12 CIMP markers, namely, ADAMTS1, CHFR, IGF2, IGFBP3, NEUROG1, SFRP1, WRN, CRABP1, MGMT, RASSF1A, RUNX3, and SFRP2 was also frequently higher in CRC tissues compared with adjacent normal tissues (Figure 2A). In normal colon cells, SLC8A3, ZNF272, IGF2, APC, MGMT, and CDKN2A were methylated. All genes were hypermethylated in one or more CRC cell lines except WRN (Figure 2B). 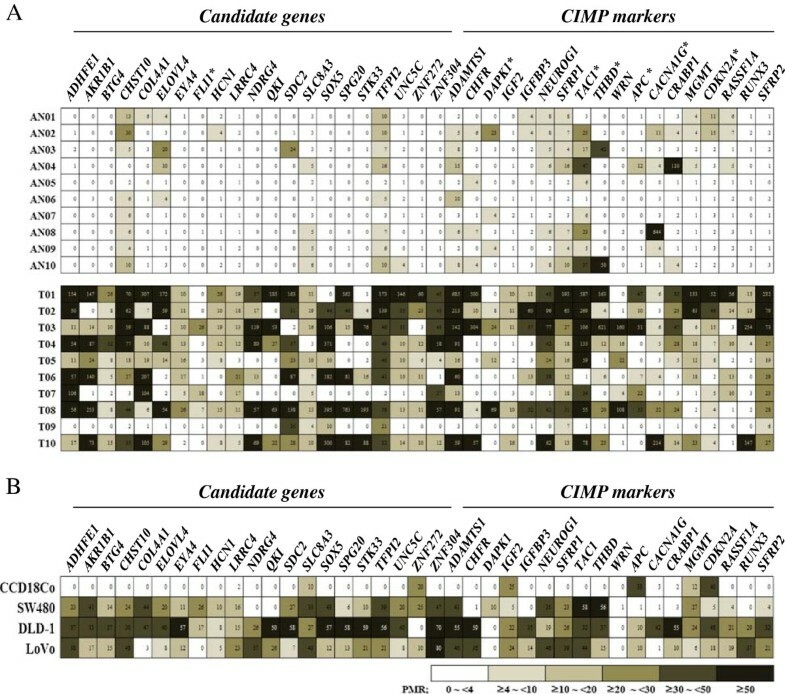 Validation of methylation status of 21 candidate genes and 18 CIMP markers. The methylation status of 21 candidate genes and 18 CIMP markers was validated using QMSP in 10 CRC tissues compared with adjacent normal tissues (A), normal colon cells, and three CRC cell lines (B). Methylated intensity ratio of QMSP data was determined by the PMR values. The significance of different methylation statuses in CRC tissues and adjacent normal tissues was defined with the analysis of variance test using Sigma Stat. Values of P < 0.05 were considered to indicate statistical significance. * indicates the methylation status of genes in CRC compared with adjacent normal tissues was not statistically significant. The 10 genes hypermethylated in normal colon cells or not significantly hypermethylated in tumor tissue were excluded for chemical treatment. Eighteen candidate genes and 11 CIMP markers were selected to identify the demethylating effects of vincristine. The methylation status of 29 genes was determined by PMR values. In normal colon cells, most genes were not affected by 5-aza-dC and vincristine treatment (Figure 3A). In contrast, 14 candidate genes and seven CIMP markers were significantly demethylated by 5-aza-dC treatment in two CRC cell lines (Figure 3B). 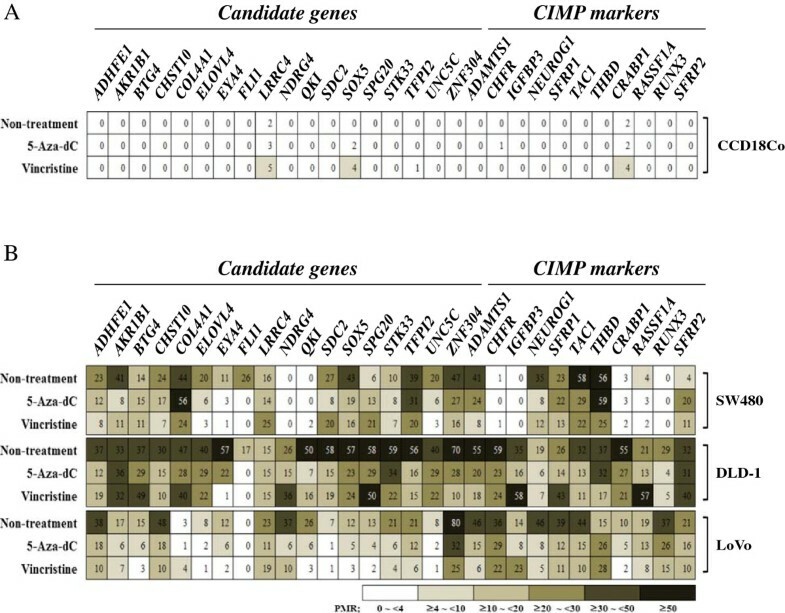 In addition, 12 candidate genes (ADHFE1, AKR1B1, CHST10, ELOVL4, EYA4, FLI1, QKI, STK33, SOX5, UNC5C, and ZNF304) and eight CIMP markers (ADAMTS1, CHFR, CRABP1, NEUROG1, RUNX3, SFRP1, THBD, and TAC1) were significantly demethylated by vincristine treatment in two more CRC cell lines (Figure 3B). Demethylating effect of 5-aza-dC and vincristine on methylated genes in three CRC cell lines. Changes in the methylation status of hypermethylated genes in normal colon cells (A) and CRC cells (B) were identified by QMSP after treatment with 30 μM 5-aza-dC or 100 nM vincristine for 48 h at 37°C. Methylated intensity ratio was determined by the percentage of methylated reference (PMR). The effect of methylation on mRNA expression was investigated by MSP and RT-PCR analysis in 5-aza-dC- and vincristine-treated DLD-1 and CCD18Co cells. 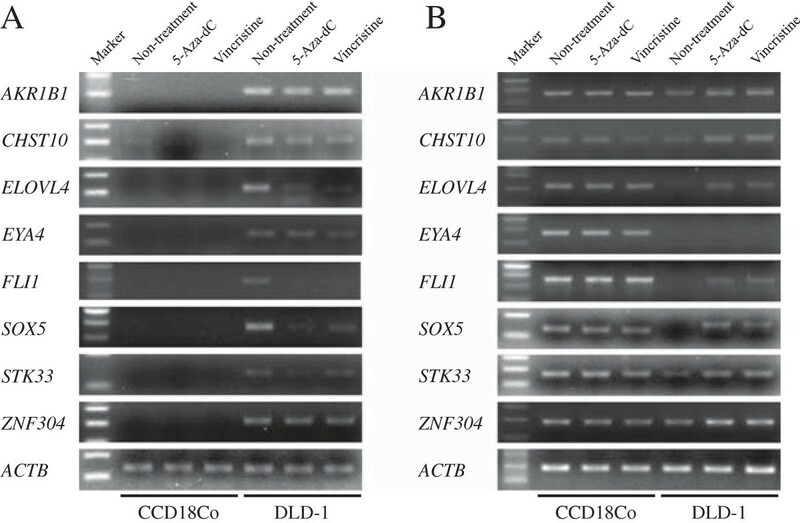 The methylation status of CHST10, ELOVL4, EYA4, FLI1, STK33, SOX5, and ZNF304 was decreased by treatment with 5-aza-dC and vincristine in DLD-1 cells, but were not changed in CCD18Co cells. The methylation status of CHST10, ELOVL4, EYA4, and ZNF304 was highly decreased by vincristine (Figure 4A). The mRNA expression of AKR1B1, CHST10, ELOVL4, FLI1, STK33, SOX5, and ZNF304 was increased by treatment with 5-aza-dC and vincristine in DLD-1 cells, but EYA4 mRNA expression was not detected. The mRNA expression levels of all genes were not affected by 5-aza-dC treatment in CCD18Co cells (Figure 4B). The methylation of AKR1B1 was not decreased significantly by treatment with 5-aza-dC or vincristine, but the mRNA expression levels of this gene were increased (Figure 4). These results suggest that vincristine promotes the demethylation of CHST10, ELOVL4, FLI1, SOX5, STK33, and ZNF304, and the methylation-mediated silencing or down expression of these genes was restored by vincristine in DLD-1 cells to the same extent as 5-aza-dC, as measured by mRNA expression. Association between DNA methylation and mRNA expression of eight genes in CCD18Co and DLD-1. The DNA methylation status (A) and mRNA expression (B) of eight genes, including six newly identified hypermethylated genes, was measured using QMSP and RT-PCR in CCD18Co and DLD-1 cells following 30 μM 5-aza-dC or 100 nM vincristine treatment for 48 h at 37°C. ACTB was amplified simultaneously with the other PCR products and was used as a control for DNA methylation and mRNA integrity. Marker: molecular weight DNA marker. This study identified novel hypermethylated genes in CRC through a genome-wide study. DNA hypermethylation leads to the downregulation and silencing of tumor suppressor genes during the pathogenesis of various human cancers [10, 34–36]. Recently, genome-wide array-based studies have reported altered DNA methylation gene profiles in CRC [22–24]. Oster et al. identified hypermethylated FLI1, ST6GALNAC5, TWIST1, ADHFE1, JAM2, IRF4, CNRIP1, NRG1, and EYA4 genes in the adenomas and carcinomas of colorectal lesions . Kim et al. also reported 20 top-ranking hypermethylated genes in CRC . Mori et al. identified several novel candidate CRC biomarkers including VSX2, BEND4, NPTX1, BTG4, and GLP1R . In our methylation chip array results, we discovered 1,411 hypermethylation CpG sites that were located in the promoter CpG islands of 597 genes (data not shown), and selected 21 candidate genes for further study (Figure 1). Several candidate genes were consistent with previous reports, such as BTG4, FLI1, TWIST1, ADHFE1, UNC5C, and SPG20 [22–24]. We validated the methylation status in the promoter CpG islands of candidate genes by QMSP for the investigation of large contiguous CpG sites, the results of which were concordant with the array results for most genes except FLI1 (Figure 2A). Among the various CIMP markers in CRC, 18 CIMP markers were selected for the validation of methylation status and methylation-based therapeutic targets in CRC. ADAMTS1, CHFR, DAPK1, IGF2, IGFBP3, NEUROG1, SFRP1, TAC1, THBD, and WRN were also hypermethylated in our chip data (data not shown). In our QMSP results of CIMP markers, DAPK1, TAC1, THBD, APC, CACNA1G, and CDKN2A were not significantly methylated in CRC tissues (Figure 2A). These discrepancies may be due to differences in the epigenomes of tumors or patient ethnic background. The hypermethylation of AKR1B1, CHST10, ELOVL4, SOX5, STK33, and ZNF304 have not been previously reported in CRC. AKR1B1, aldo-keto reductase family 1, member B1, catalyzes the reduction of aldehydes including the aldehyde form of glucose. It was reported to be downregulated in endometrial cancer and gastric cancer [37, 38]. The product of CHST10, carbohydrate sulfotransferase 10, is known to inhibit the invasiveness of melanoma cells . ELOVL4 gene product, elongation of very long chain fatty acids 4, is responsible for the biosynthesis of fatty acids . Hypermethylation of ELOVL4 was reported in hepatocellular carcinoma and pancreatic adenocarcinoma by genome-wide methylation analysis [41, 42]. SOX5 is a member of the SOX (SRY-related HMG-box) family of transcription factors. It is well known that SOX5 regulates embryonic development and determines cell fate . STK33, serine-threonine kinase 33, is located on chromosome 11p15.3, a gene-rich region that has been associated with human diseases and malignancies . ZNF304, zinc finger protein 304, combines two conserved domains, class II AU-rich elements and a Krüppel-associated box, and is associated with the regulation of lymphocyte activation . DNA methylation-mediated silencing of gene expression can be restored by demethylation agents such as 5-aza-dC. DNA methyltransferase inhibitor, 5′-azacytidine, may act as an inducer of cell differentiation by causing de-methylation and re-expression of genes silenced by hypermethylation . 5-Azacytidine was approved in 2004 by the US Food and Drug Administration for treating myelodysplastic syndrome , and 5-aza-dC as a 5-azacytidine analog was widely used in DNA methylation studies . Vincristine is a microtubule inhibitor and is commonly used for chemotherapy in pediatric acute lymphoblastic patients . Several anticancer drugs are associated with drug-induced DNA hypermethylation in human lung adenocarcinoma and rhabdomyosarcoma cells . Interestingly, the methylated cytosine was reduced after treatment with concentration of vincristine less than 100 μmole but it was induced after treatment with higher than 1000 μmole in human lung adenocarcinoma cells . In this study, we selected 100 nM as an optimal concentration of vincristine which does not effect on the viability of CRC cells using MTT assay. Vincristine induced demethylation of methylated genes in CRC cells to the same extent as 5-aza-dC. In addition, vincristine restored the mRNA expression of CHST10, ELOVL4, FLI1, STK33, SOX5, and ZNF304 in CRC cells. Interestingly, the methylation status of AKR1B1 was not affected, but its mRNA expression was increased by both drugs. It may be regulated by upstream genes, with a demethylating effect by both drugs. Our results provide insights into the potential functional impact of vincristine on methylated genes in CRC. This study has identified novel candidate genes, AKR1B1, CHST10, ELOVL4, SOX5, STK33, and ZNF304, and provided evidence for their suitability as methylation biomarkers of CRC. We also analyzed the DNA methylation-based therapeutic effects of vincristine in CRC. This study was supported by the Basic Science Research Program through the National Research Foundation of Korea (NRF) funded by the Ministry of Education, Science and Technology (grant number: 2010–0024117). JWM designed the study and drafted the manuscript. SKL and YWL prepared the clinical specimens and participated in the organization of clinical data. Dr. JOL, NK and SJK participated in the analysis of methylation array results and searching references. Dr. HJK helped the arrangement of results. Prof. JK provided the clinical specimens and clinicopathologic informations. Prof. HSK helped analyzed the results and revised the manuscript. Prof. SHP supervised the study and revised the manuscript. All authors read and approved the final manuscript.